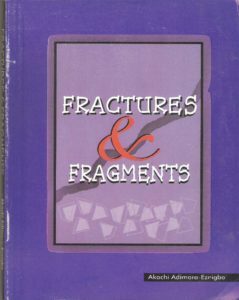 Fractures and Fragments capture’s various fervid and soulstirring scenes that pose critical questions to perceptive minds. It is filled with dramatic narratives of pertinent universal human conditions – a bodily accident which results in a fracture, the human problem of language communication, and the phenomena of exile and loneliness, among others. It interrogates and seeks to upturn, at least aesthetically, the terms of a global crisis – the lived experience of racist sentiments and attitudes. Importantly, it zeroes in on various local dimensions of contemporary experience in a society that has become characterized by disorder, fraud, egoism, underdevelopment, faithlessness, hooliganism in low and high places, and the regrettable collapse of laudable traditional values. Yet, the young men’s revolt against the odi ike dance in the last story serves as a ray of hope and source of positive change for a forlorn generation. The stories are deftly crafted and very engaging as the writer ‘sits on top’ of her language with such mastery that seems to transport the reader into the realm of the sublime.